Let's start with A, which stands for Anything You Like. Drink what you like! Christmas covers everything from turkey to standing rib roast to takeout Chinese to whatever your tradition is. There is no right (or wrong) answer when it comes to wine. So I'm going to jump to the end of the alphabet and, as a bookend to A, suggest that Z is for Zweigelt. Specifically, the Hofer Zweigelt. In a one liter bottle. Sealed with a bottle cap. And, if you thought it couldn't get any better, it's certified organic! So what's so great about it? Let's start with the bottle cap seal. No need for a corkscrew! Ever open a bottle of beer? You're good to go. And the big one liter bottle keeps you at the holiday table longer, with 33% more wine than those measly, standard 750ml size bottles. Oh, I guess I should tell you a bit about what's inside the bottle. It's an Austrian red made from the Zweigelt grape. A bit of an esoteric and obscure pick, I admit, but these are the kind of wines I find charming. If you like Pinot Noir or Beaujolais, this is a great wine: light, fresh, and easy to drink. Delicious! And it plays nice with a wide range of foods. Uncork Uncap and enjoy! 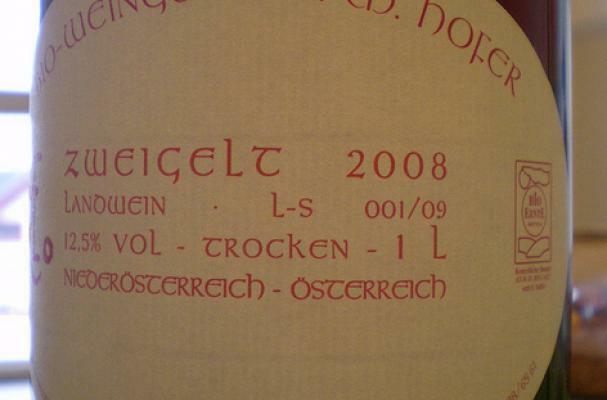 This post was mentioned on Twitter by foodista: New blog post: Christmas Dinner Wine: From A to Zweigelt http://www.foodista.com/blog/2009/12/23/christmas-dinner-wine-from-a-to-zweigelt/..